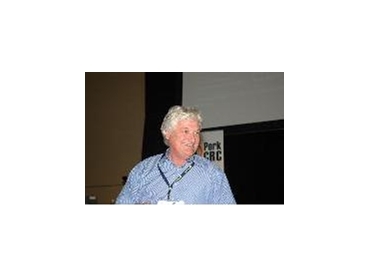 Opening the 2007 Pork Cooperative Research Centre (CRC) annual conference and update in Brisbane, CEO, Dr Roger Campbell, described researchers, including students as the industry’s future. He announced that 26 Pork CRC scientific papers had been accepted to be published at the 11th Biennial Australasian Pig Science Association conference, which followed the CRC conference. Effectively setting the theme for a dynamic and informative one day CRC conference for 100 delegates, Dr Campbell noted, however, that great research findings meant nothing until they were adopted by industry. Addressing the conference on the issue of commercialisation of research, CRC Board member, Andrew Maughan said all future research proposals to the CRC must include a business plan and all researchers had to focus on maximising value by delivering their findings into the hands of pork producers. Along with CRC Business and Finance Manager, Michael Crowley, he is ensuring the Pork CRC develops a commercially focused culture. To help achieve this, new user friendly software has been developed and a commercialisation training camp will be held for researchers in February. Dr David Meisinger, CEO of the US Pork Centre of Excellence and Paul Pattison, CEO, QAF Meat Industries, were conference keynote speakers. Dr Meisinger told delegates that US pork producers were losing money, due mainly to high grain prices and high pig numbers, with the over-supply probably due to increased progeny survival associated with using Circo-virus related vaccines, considered ‘wonder drugs’ by US producers. He estimated that 110 million pigs would be slaughtered in the US in 2010. US trends he highlighted included limiting litter sizes, as some piggeries had gone as high as 30 pigs weaned per sow per year and older weaning ages (21-24 days, rather than 10-14 days). Important traits for the pork sector in the US include: robustness, adaptability, longevity, balanced breeding, biodiversity, meat quality and food safety. Interestingly, Dr Meisinger traced the characteristics of what he termed the ideal pig over the last 20 years, noting that producers were first concerned about performance, then carcass composition and then pork quality. “Now the ideal pig must address human nutrition,” he said. Mr Pattison, speaking as an Australian producer and processor, said industry expected the Pork CRC to deliver methodologies that cut production costs. He suggested cost of production could rise from $1.60 to $3/kg HSCW. On an optimistic note, Rob Smits, also of QAF, has just published some Pork CRC supported research which may help reduce production costs this summer. The experiment, at Corowa, NSW, in the summer of 2006/07, considered the effects of five levels of digestible energy, ranging from 13.0 to 15.3 MJ DE/kg, offered 300 lactating gilts, on the performance of piglets to weaning at 27 days and the subsequent reproductive performance of the sows. Smits said that aside from the weaning to remating interval falling from 8.2 days for sows offered the lowest energy diet (13 MJ DE/kg) to 5.7 days for gilts offered a diet containing 14.7 MJ DE/kg, the key data, in terms of sow longevity, was retention rate, which was about 30 per cent higher for gilts offered the three higher energy diets (14.2-15.3 MJ DE/kg). Assuming 10 extra sows per 100 sows could be retained from lactation to subsequent farrowing, by feeding 14.7 MJ DE instead of 13 MJ DE and 10 replacement gilts cost $3800, the diet cost per sow between 13 and 14.7 MJ DE was $7 per sow over 26 days, plus five days pre-farrowing, or $700 per 100 sows. “This equates to a five to one payback. Saving sows doesn't take much to pay back the extra diet costs,” Mr Smits said. The results suggest that energy intake in the first lactation is likely a major factor affecting the subsequent fertility of sows and, potentially, longevity. Dr Campbell said Pork CRC researchers such as Mr Smits and his QAF colleagues, Dave Williams, Peter Rich and David Henman, plus Dr Ray King of RHK Consulting, were doing a magnificent job.